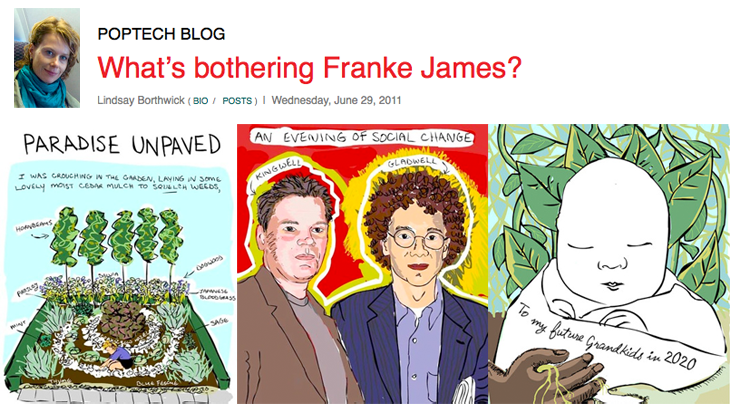 PopTech: What’s bothering Franke James? What’s bothering me? How would Lindsay Borthwick at Poptech know what’s bothering me? Oh yes… I guess revealing what nags at me in my book Bothered By My Green Conscience sets me up for just that kind of probing article… Thank goodness this was Poptech and not a cheesy tabloid! I did laugh at the title. PopTech, based in Camden, Maine, USA, is a network of social change makers. Online, and through their conferences, they bring together remarkable people talking about the ideas and innovative projects that can shape a more positive future for us all. Imagining that future, and helping others see the vision and how to make it really happen, are what makes Poptech so powerful and effective. So, I was delighted (thrilled) that Poptech chose to feature Bothered By My Green Conscience, and my recent visual essays. And use them as inspiration for others to wake up and tune into their green conscience. Are you ever annoyed by your “green” conscience—that voice inside your head that nags when you forget to bring reusable bags to the grocery store or leave the tap running for too long? Artist-activist Franke James’ was, so she combined her numerous talents to produce ‘Bothered By My Green Conscience‘, a book of five visual essays about her mid-life struggle to adopt a more sustainable lifestyle and confront today’s most pressing environmental issues. With this graphic novel, James pioneered a way of communicating about a cause that’s neither impersonal nor chronically negative—two words so often associated with the way we talk about the environment. The novel’s pages are a pastiche of colorful illustrations, photographs and script. In some ways, the visuals are just the supporting act. It’s James’ storytelling that most resonates, probably because she keeps them personal—humorously chronicling her own musings, misconceptions and moments of discovery. Read Lindsay Borthwick’s full review at Poptech.